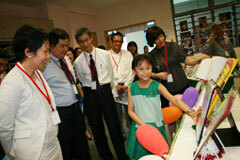 Singaporean kids are good in reading, science, reading and mathematics. There is no doubt about that because they topped examinations. However, when it involves communicating in English, Singaporeans fare poorly. Singaporean kids lack the skill to communicate extemporaneously. With this, schools have considered a system – STELLAR (Strategies for English Language Learning and Reading). STELLAR will encourage the students to express themselves clearly. STELLAR furthermore aims to fortify children’s reading and language skills; STELLAR also aims to stimulate positive attitude towards education and learning. Interaction with other kids: The best thing that you can do is let your kids interact with other kids. Your kids should be given opportunities to socialize with their fellow kids. Encourage your kids to show off his/her talent: If you want to improve the natural talents of your kids, you should encourage them to show off their talents. It is the best way to build self-esteem. Encourage your kids to participate in many activities: Apart from encouraging them to show off their talents, you should also inspire your kids to participate in other activities. It will broaden their social circle. Have your kids decide what they want to wear: The basic thing that you can do to bring out their identity is to bring them to shopping and have them decide what they want to wear. The key is to build their self-esteem and self-confidence. When they feel confident, they will express themselves better. You should not overlook the communications skills of your kids if you do not want them to be introverted.